The area of Los Angeles south of the 10 Freeway is not generally known for its shopping or dining destinations, nor for its great public spaces. But the region is home to an important shopping mall that has demonstrated the hunger in South L.A. for grand places where people can meet and make memories. That mall, Plaza Mexico, sits just outside the Los Angeles city limits (as is the case with many retailers trying to avoid L.A. taxes and regulation) in the smaller city of Lynwood, overlooking the 105 Freeway. But it relies heavily on the people of South L.A., and thus attests to the transformations that have occurred there in the past 50 years. Plaza Mexico was originally built as the Lynwood Marketplace and financed in part by a development incentive program set up to deter white flight in the 1970s. Lynwood, like South L.A. to the north, was white (“Lily-white Lynwood”), then majority black, and by the late 1980s, predominantly Latinos. By the 1990s, all the department chains that anchored the mall had shut their doors. For a time, the Lynwood Marketplace turned into a vendor-driven swap meet, offering bargain-priced clothes and electronics and frequented by local residents, mostly African-American or Latino. But early in the 2000s, the mall was transformed into Plaza Mexico, to tap two trends. First, many Mexicans and Mexican-Americans in South L.A. and in nearby communities were buying homes and gaining purchasing power. And many felt nostalgia for their home country, or the yearning to reconnect with the home country of their parents or grandparents. Plaza Mexico was an ambitious Mexican-style plaza featuring replicas of iconic buildings and monuments from several Mexican states. The old mall, now a newly remade plaza, could not attract a major national department store as an anchor tenant. But it didn’t need to. Plaza Mexico played a different role, offering a remarkable diversity of goods and services and even office space, while retaining the swap meet and food court sections that had attracted previous generations of customers, many of them African-American. In this way, the plaza set a new standard for retail and public space for the south side of greater Los Angeles. It’s reflected in the mix of stores in smaller shopping centers all over South L.A.
… these shopping centers have made good on their title claims to la plaza, the public square, becoming fixtures in the social, public, and civic life of the communities that surround them. One example of an effort to emulate Plaza Mexico is Plaza La Alameda, opened in 2008 in Walnut Park, an unincorporated area south of Huntington Park and north of Watts. Its location, just east of Alameda Street, resonates because the Alameda corridor was long considered “the wall of hate”—rigidly separating South L.A.’s communities of color from the white, working-class cities to the east of the thoroughfare well into the 1970s. By the 1990s, most white residents had moved out of Huntington Park, South Gate, and other southeast L.A. suburbs, which then became majority Latino. And now, the plaza connects rather than separates neighborhoods in all directions. Plaza Mexico and Plaza La Alameda share architecture that deliberately recalls the Spanish and Latin American tradition of the plaza as a central space. Unlike the car-centered architecture of the suburban mall, the plazas are pedestrian-accessible and located near public transit centers. Plaza Mexico and Plaza La Alameda both feature kiosks and fountains that serve as central gathering areas. While there is no government or church on these plazas, as you would find in some Latin American central urban plazas, the focus on pedestrians makes it a site of gathering and consumption for nearby residents. Plaza Mexico and its imitators have given greater South L.A. locations for celebrations ranging from Mexican Independence Day festivities in September to religious holidays such as the feast for the Virgin of Guadalupe in December. And the plazas have become the go-to spots for impromptu celebrations like those occasioned by the few and far between World Cup victories of the Mexican national soccer team. In this way, these shopping centers have made good on their title claims to la plaza, the public square, becoming fixtures in the social, public, and civic life of the communities that surround them. Yes, both shopping centers are also utilizing their customers’ fondness of Mexican plazas as a marketing tool, but it has been a very successful effort, allowing the centers to thrive in economically challenged communities. Indeed, Plaza Mexico has had success in reaching beyond the immediate area and attracting other residents of Southern California. Plaza Mexico is what the urban planner James Rojas calls an “enacted environment,” a term describing exterior spaces between buildings that people can use as they please. In such places, a store sign becomes a work of art, and a walkway—or the plaza of a mall—becomes a place for social interactions and encounters with new people and new experiences. 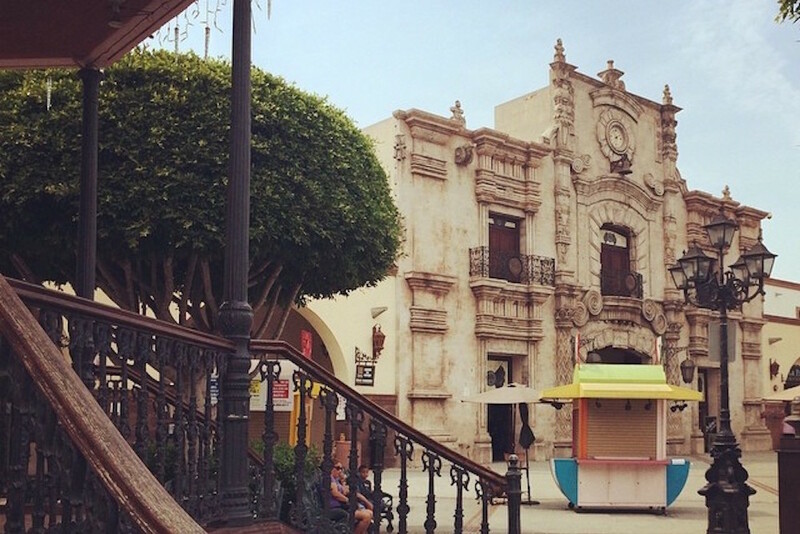 Plaza Mexico is thus a model for the kind of destinations that are needed more in South L.A. and in Southern California. Jorge N. Leal is a Ph.D. candidate in the History Department at UC San Diego and an adjunct professor in History and Chicana/o and Latina/o Studies at CSUN and CSULA. Primary Editor: Callie Enlow. Secondary Editor: Joe Mathews. *Photo courtesy of Plaza Mexico.